It used to be that Black Friday sales started at 7:00 am the day after Thanksgiving. Then stores started opening at 6:00 am. Then it was 5:00 am for a few years, and then some started opening at 4:00 am in the last year or two. This year, some stores at the Columbia Center Mall opened at 3:00 am. But no one beat Toys-R-Us, which opened the minute that Thanksgiving was over. How’d you like to be one of the employees there? You probably had to show up for work 4-5 hours early to start setting up for the crowd. So much for Thanksgiving evening with the family. What’s next? Stores opening at 11 pm Thanksgiving night? 9 pm? Meanwhile, I noticed a lot of online retailers didn’t even bother waiting for Black Friday. They were pimping big “Thanksgiving Day-only” sales online, maybe hoping to get shoppers to spend a lot of money in a turkey-induced haze. 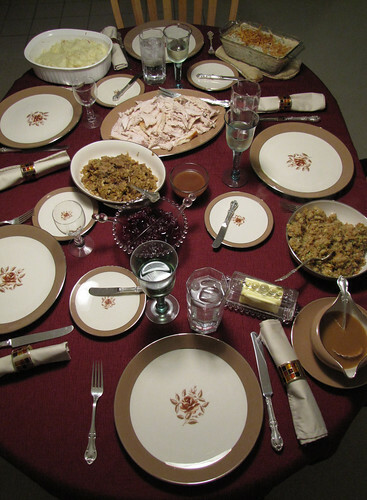 Thanksgiving — the holiday itself — is becoming an afterthought. Black Friday is killing it, and quick. But we did our best to celebrate it this year. Our good friend Tassoula came to visit and enjoy a great Cari-cooked meal with us. Dee-licious! Hope you had a great Thanksgiving, too! The Case Against Jim Mora Jr.
Could not agree with you more. Working retail is no walk in the park, but it can become a more distinct challenge in some cases by the actions of customers who have forgotten this very thing…being thankful for all of our blessings. The only way to avoid that stores are open late or way too early as a customer is not to buy at times you don’t want to work either. People just don’t have more money to spend than they have. So, if we, the customers, only spend our money on decent times, shops will not be open on those tiems when no one buys. It’s not just your side of the Atlantic that we’re seeing things like this. More and more places are starting the January Sales (our nearest equivalent) on December 26th – Boxing Day, which is when it’s traditional to visit family that you didn’t see on Christmas Day. Holidays just don’t fit in with the 24 hour corporate ethos.